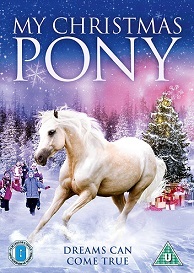 My Christmas Pony is released on DVD November 7th And to celebrate we have a great competition for you and 3 copies on DVD to give away. Juliet leaves the city to join her mother Karen on a visit to her late grandfathers struggling ranch in the country. At the ranch, Juliet meets her grandfathers horse Rodeo and young cowboy Monty. Monty agrees to secretly train her to compete so she can raise funds to keep Rodeo. In the meantime, Karen finds out that Hugh, her ex-fiancé, claims rights to the ranch, and the two battle while stirring up old feelings. It'll take everyone coming together if they are going to save the ranch.